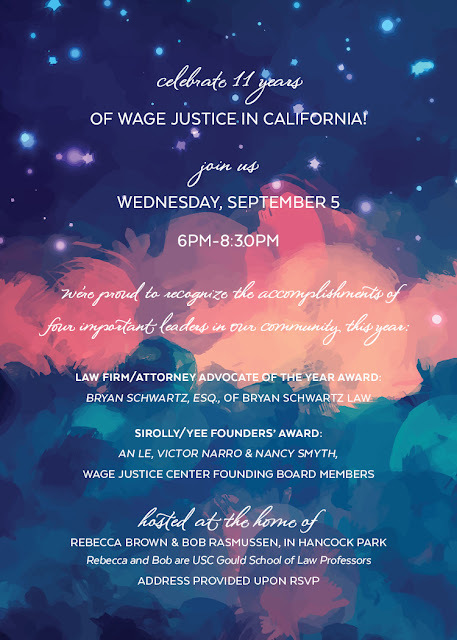 Today, Bryan J. Schwartz, principal at the law firm Bryan Schwartz Law, will accept the 2018 Attorney Advocate Award from the Wage Justice Center at an evening fundraiser in Los Angeles, California. (See press release here). The Wage Justice Center fights for economic justice on behalf of low-wage workers in California. The non-profit organization specializes in piercing corporate shell games to hold employers accountable when they commit wage theft. Bryan Schwartz Law regularly represents low-wage workers in wage and hour class actions. The firm seeks swift relief for its clients, and pursues justice for as long as it takes. The firm continues its fight for the class of restaurant employees who suffered wage violations, after securing a major victory at the court of appeals. In Turman, et al., v. Superior Court (2017) 17 Cal.App.5th 969, California’s Fourth District Court of Appeal, Division Three (in Orange County), held that an individual owner and president of a closely-held corporation may be personally liable in a lawsuit to recover overtime, meal and rest period premiums, tip compensation, and minimum wages under California law. Turman provides the first published state appellate interpretation of Martinez v. Combs (2010) 49 Cal.4th 35, the California Supreme Court’s marquee decision on the definition of an “employer,” as it applies to personal rather than corporate liability. On remand, the Superior Court recently ruled that the individual owner of the restaurants was may be liable as a joint employer with respect to the class claims under the Labor Code, Wage Orders, Business & Professions Code, and Private Attorneys’ General Act. (Read more about the Turman decision on our blog here and here). For more information about Bryan Schwartz Law, please contact Bryan Schwartz at Bryan@BryanSchwartzLaw.com.